“Hitler’s Orphan: Demetri of Kalavryta” by Marc Zirogiannis is a historically based fictionalized story of the author’s grandparents, both of whom were executed in one of countless Nazi German atrocities. Three-year old Demetri survived the massacre in the Greek village of Kalavryta and thus became one of the orphan’s created by Hitler and the Nazi regime. The author always knew that his father was an orphan, but his epiphany came with some research at the Greek Consulate in New York City. The author discovered the massacre, the killing of his grandparents, the rescue of his father by a villager, and the boy’s refuge in an Orthodox Church. The book is historical fiction. Those of us who do historical research know that archives and records yield but the barest of facts. It takes imagination and creativity to fill in the blanks and create a real story. Zirogiannis does just that, starting with the barest of information and building a dramatic and compelling story of Greek villagers innocently swept into the horrors of the war. Zirogiannis builds the story slowly, with the birth of Demetri, the invasion of Greece by the Italians and then the Germans, the collaboration of the Greek government, the resistance efforts of the Greeks, and finally, German retaliation at Kalavryta. The retaliation took the form of the murder of hundreds of innocent villagers. The biggest concern, at least to me, is the book’s brevity. It is only 34 pages, and reads more like a magazine article than a book. It has character, setting, and plot, which could have been developed into a far more gripping tale. Perhaps the author was leery of adding too much fiction into his personal, family story. But, once he decided to add some fiction to his story, one is left with the notion that he should have gone all in. Issues aside, “Hitler’s Orphan: Demetri of Kalavryta” by Marc Zirogiannis is an easy-to-read and quite personal summary of one tragic episode in the history of Greece. So many such tragedies occurred in Europe during the war, it is easy to overlook the massacre of the Kalavryta villagers. 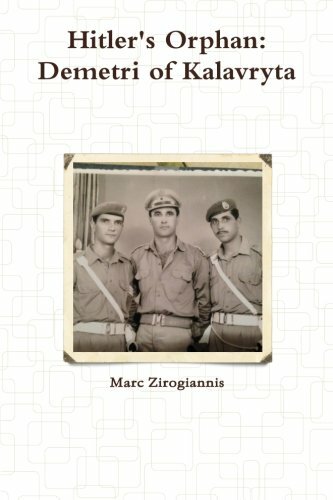 Zirogiannis’ book helps ensure that it is neither overlooked nor forgotten.